What’s up with the man crush? First of all, let me say I am the least homophobic person on the planet, and indeed, I think the more liberal America has become, the more okay they are with the man crush. 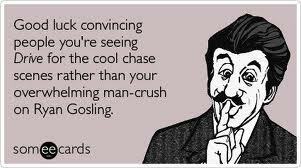 However, I am not okay with the man crush!! When men crush, they crush hard. They wrestle each other, they exchange adorable witticisms, and to be sure, they act, well not really adorable at all. When my son did his latest School of Rock performance, Man Crush came. He did not sit at our table but hovered by the bar sending drinks over to my husband. I guess he did not want our ‘fierce competitiveness’ to get in the way of his good time. Today is Valentine’s Day. My husband posted a very nice comment to me on Facebook along with a YouTube link to a Paul Westerberg song. I thought this was all very nice and sweet, and commented in that vain, but I did wonder, why Paul Westerberg? I don’t really like Paul Westerberg. Within minutes I say that Guy Crush commented on the post as well. ‘Paul Westerberg, awesome,’ he said. Ah, it is all becoming clear to me now!